Remakes are a tricky proposition. On one hand, you risk offending fans of the original film by having the audacity to present a new take on familiar material. On the other hand, you may find new fans who didn’t even know that the original thing existed in the first place. I’d wager that filmmaker Michael Noer is counting on the second group for support, as remaking a classic movie like Papillon is going to ruffle some feathers no matter how it turns out. Papillon is a remake of 1973’s Papillon, directed by the legendary Franklin J. Schaffner and starring Steve McQueen and Dustin Hoffman. The original film is based on an autobiographical novel written by Henri Charrière (while the screenplay was written by Dalton Trumbo), and the story follows Charrière as he attempts to escape an island prison. The film is set in the early 1930’s in French Guyana (home of the notorious Devil’s Island). 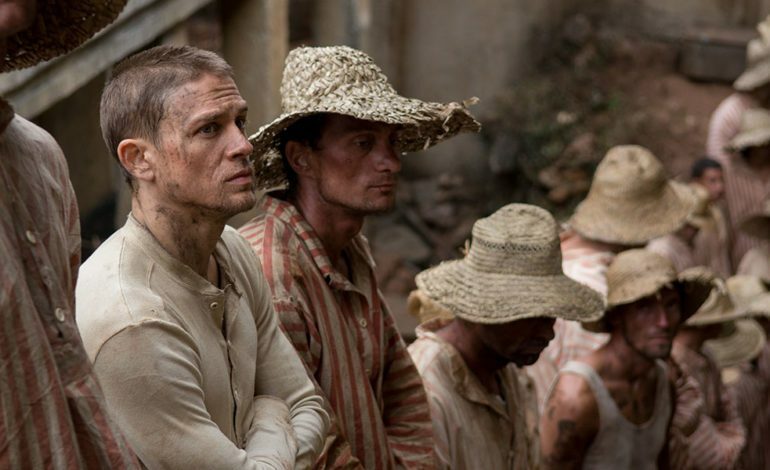 Charrière (played by Sons of Anarchy‘s Charlie Hunnam) and Louis Dega (Bohemian Rhapsody‘s Rami Malek) are convicted criminals forced to serve their time in horrendous conditions, knowing that they will never be allowed to return to France even if they are released. Charrière is serving a life sentence for murder, though he vehemently argues that he was framed. Dega is a wealthy counterfeiter, and the two men come to an arrangement where Charrière will protect Dega, while Dega facilitates their escape attempts. The movie also stars Tommy Flanagan as Masked Breton. Check out the trailer below! Papillon hits theaters on August 24th.